Kairi ki sabzi is a delicious accompaniment to meals. It stays fresh for 2-3 days in fridge. 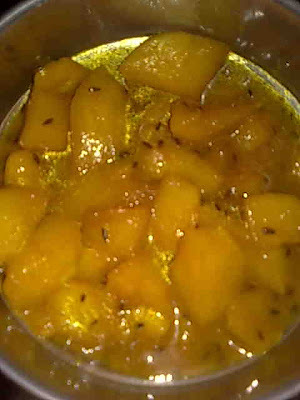 This is my mom's recipe of using unripe mangoes. So, instead of kairi, you can also use mango which is not ripe enough to consume. 1. Peel and cube kairi. 2. Heat oil in a pan and add cumin seeds. When they change color, add kairi pieces. 3. Add salt and all the spices except garam masala. Add 1 cup water and let it come to boil. 4. Add jaggery and lower heat. Cook covered till kairi softens, stirring occasionally. 4. Add garam masala and cook for 1 more minute. Turn off the heat and kairi ki sabzi is ready to have as an accompaniment to your meals. raw mango curry sounds awesome.. mouthwatering !